Managing your finances is not a very glamorous or exciting thing to do. In fact, it’s one of those things we put off and delay as much as possible. 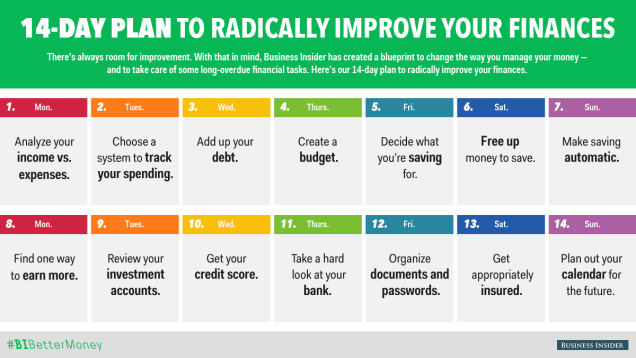 However, the folks over at Business Insider have created an amazing 14 day, step-by-step guide to help walk you through getting your finances in order. By following the plan, within two weeks, you will have a much better picture of your personal finances. The task for each day is pretty simple. It’s all about just dedicating a little time to each step. By breaking them out across a two week period, you won’t get overwhelmed and you’ll have a goal to work towards each day. If you’ve never taken a detailed look at your finances, this guide is a great place to start.